This entry was posted on October 30, 2018 at 9:43 AM and is filed under the bad, the ugly. You can follow any responses to this entry through the RSS 2.0 feed. Responses are currently closed, but you can trackback from your own site. watching SAK is like watching amrita all over again. exactly! what a striking similarity – immediately Betaab flashed in mind…..
agree, reminded me more of Soha. but combination of Soha and Amrita. They should have taken Sunny Deol son in it. No. Soha and Saif look similar. Sara is all her mother, Amrita. Amrita bad bit mannish masquline, tagda punjabi woman with broad shoulder quality to her. Maybe some will like that too in Sara. Sara is very good but she’s coming too late. She’s 25 and same age as Alia who has dozen movies under her belt. Sara doesn’t look young as such but a full grown women and close resemblance to Amrita further confirms that. Overall very good screen presence and she’s pretty and should be successful in long run but don’t see her reaching top or so. why so many dark scenes… i know flood n all but 2nd half will be difficult to watch with forcing your eyes to stress hard to watch what’s happening in screen.. . these might put off many ppl from watching it.. If there’s flood, its likely there won’t be electricity! I think the deluge happened at night. Politics aside..I am happy someone making movie around events. It would have preferred just disaster movie than love story in disaster. ps. – Recently saw Bengali movie “Kabir” which was around arrest of Yasin Bhatkal. there is a bit of a Satyam Shivam Sundaram element to this. I like the idea. Let’s see how good or not the film is. It would have been disaster if Titanic was just a disaster movie and not love story in disaster. 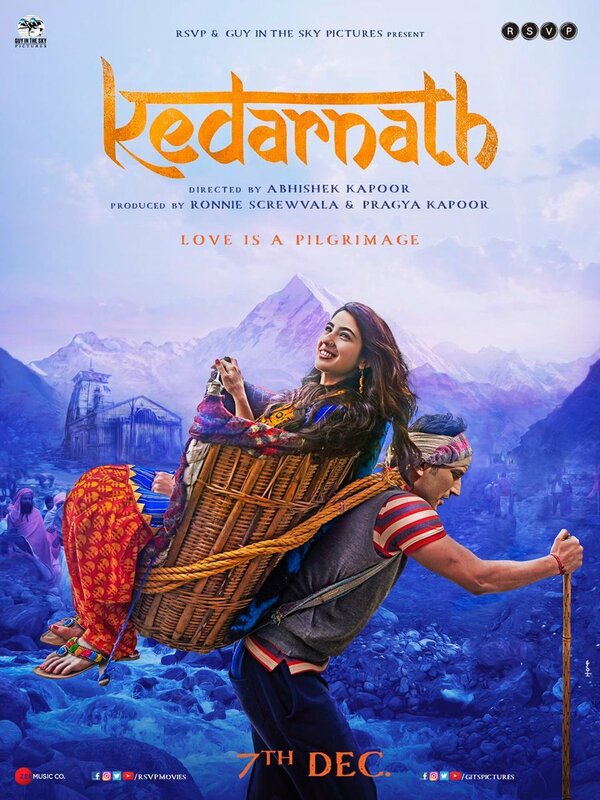 Folks missing the main point – I don’t know how people will receive this love story of a muslim guy and hindu girl during a kedarnath pilgrimage. It’s not the ideal love story for boxoffice given the times we live. so aptly put master. was thinking in similar lines..
Am I missing something? Where does it say it’s a Muslim man and Hindu woman? Even if that’s the case, I don’t see why filmmakers should bow down to misogynists who want to treat Hindu women like religious property that only Hindu men have the right to date and marry. If the audience can accept Bajirao Mastani where a Hindu man falls for a Muslim woman so happily they should be willing to do the same with a gender-reversed love story or their bigotry and sexism will show. On a different note, Sara Ali Khan is the most refreshingly natural looking debutant in Bollywood in a LONG time! It’s nice to see a star daughter who has been ‘groomed’ for celebrity with excessive plastic surgery. You need to see the ‘teaser’ more carefully to get it. Yes, now you are missing something. The teaser showed a scene where Sushant is making dua. I have seen many hindu men making dua at many darghas so it’s possible that could be the case here. Hindu man and muslim woman is okay. Muslim man and hindu woman is love jihad, can’t have that. Not directly about that but having a love story during pilgrimage itself is not good idea. Muslim labor working near that kedarnath temple and gets involved with a Hindu girl who came to pray and then kissing, etc.. well..
You need to scroll through the comments section on YouTube where it’s already been declared an anti-hindu movie by majority of the commentators with full of anger and hate against the ‘alleged love story’ between a Hindu girl and a Muslim boy at Hindu’s holy place and against ‘the kiss’ in the trailer!! It’s going to face a lot of protests before its release for sure!! Elections are due next year & what’s better than this ready-made polarising issue of ‘love jehad’ where Hindu girl is being played by a Muslim actress who is the daughter of Saif Ali ‘Khan’!! It’s going to be a troublesome release for sure. Didn’t read the comments till now for any video on youtube. I won’t be surprised if that’s the case. most of the people are against making love story out of a natural disaster where there was substantial loss of life happened. Then there are those who do not like dharmic place and kissing scenes. So there are multiple level objections from public. Not love jehad. That is almost not important because lot of hindu muslim romance movies are already made in BW. Even india pakistan romance movies have come. this one is heading for a trouble – sad but harsh reality! There is enough Hinduism in this trailer to make this a blockbuster in India. Effects are good and this could really be nicer than the trailer. Sushant is a very good actor and gels with any role. Soha is a natural beauty. The paid is looking pleasant. Looks to be a real good story. don’t think this movie is going to work with audience… but promotions will be huge to promote sak… so it might get close to dhadak revenue.. n if movie is not good then it will be near bgmc money..
By the way just realized Kanika Dhillon (MM) has written this one. Should be interesting.